The Rolling Stones are a quartet of energized rabbits that just will not hang up their hunger for the tour circuit. Well on the way into their fifth decade of a touring career, the Stones pulled off a rare free performance at Rio de Janeiro's Copacabana Beach. Saturday, February 18, 2006, was yet another career high for this incredible British institution. 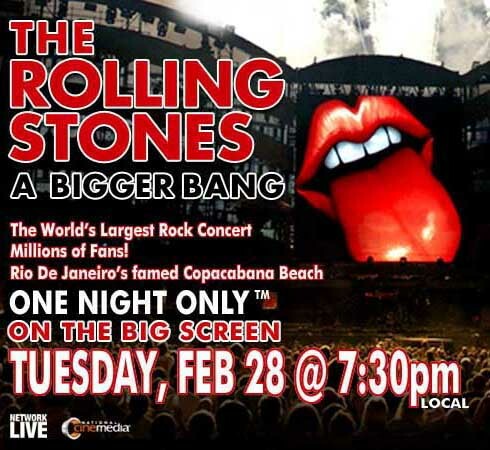 The Rolling Stones staged A Bigger Bang - The Word's Largest Rock Concert, welcoming in excess of one millions fans literally beachside in Rio. The event was filmed and beamed via satellite one week later across the U.S.A. for American audiences to enjoy in a theater setting for One Night Only at 7:30 PM on Tuesday, February 28, 2006. The Stones have always been willing to embrace new media avenues. The initial February 18th Rio performance was broadcast live in America exclusively on XM Radio and available online via AOL.com for cyber spectators. To promote their A Bigger Bang Tour, the Stones did not schedule a Pay-Per-View broadcast, which has been the norm with all of their U.S. tours since 1981 (with the exception of 1999's No Security Tour). Instead, a deal was struck with National CineMedia to conduct a simulcast broadcast of the filmed Rio performance directly into US movie theaters. The Rolling Stones launched their current world tour in Boston at Fenway Park six months previously. With an abbreviated break over the Winter holiday season, the band resumed their North American tour leg before conducting a handful of South American dates. A Bigger Bang was staged as a massive free performance for their Brazilian fans. The Rio stage was introduced by the Stones at the Copacabana Beach with intense color bursts. The film began quickly with Keith Richards kicking off the evening with "Jumpin' Jack Flash". A cool million in human bodies jammed on the beach, spilling into the street, crowded together to enjoy the Rolling Stones live. Glimpses of boats bobbing in the mellow tide were docked in the surf just off the beach. Thankfully, there were no warnings from the weather service to keep an eye out for any Tsunami wave thrusts. The phrase media saturation is not in the Stones dictionary. Rabid fans are salivating at the notion that the Copacabana Beach performance will end up on DVD. The Stones are a tried and true Rock'n Roll Band brand. Their collective energy level is winning over casual fans and attracting new audiences around the globe. Everything's turning to gold for the Stones. Their infamous Logo is lapping up as much capital as fans of all ages will empty out of their wallets and purses. The 2005-2006 A Bigger Bang World Tour has been estimated to potentially earn a staggering $400 Million USD when the tour wraps up during the last weekend of August 2006, in Cardiff, Wales.